We love eggs around here and Leandro especially likes them hard-boiled. 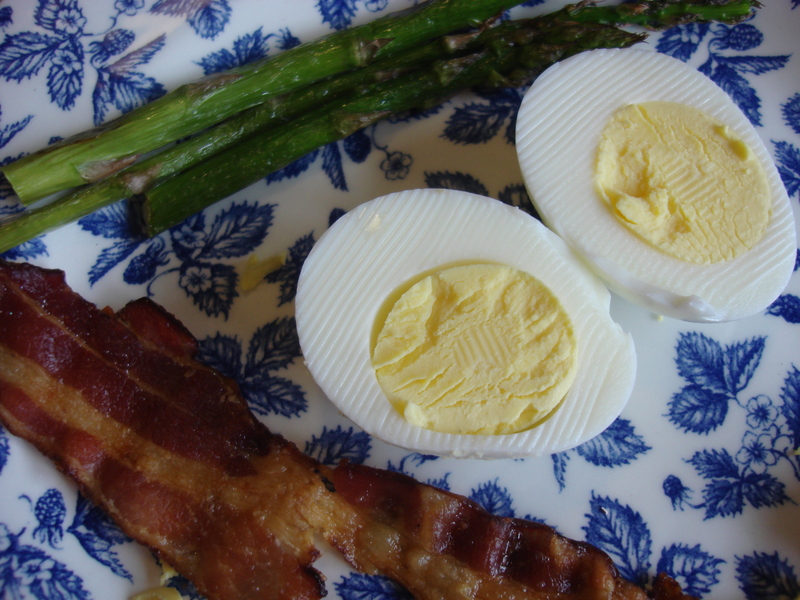 One of our favorite laid-back dinners is hard-boiled eggs with broiled asparagus. Olive oil to coat the asparagus and a bit of salt for both eggs and vegetable is all the seasoning we need. The length of time it takes to bring the water to a boil when the water covers the eggs by an inch is the magic time period! As you might guess, I almost invariably buy organic eggs when I buy in the supermarket and from local folks whenever possible. And yeah, they tend to cost a lot more. To me they are worth it in terms of better conditions for the hens and less chance of harmful chemicals for my son. The taste however? Well I don’t find any appreciable difference. It is mostly when I buy local free-range eggs that I notice a difference in the vibrancy of the yolk color and the intensity of flavor. Leandro’s favorite breakfast. Or lunch. Or dinner. And don’t be fooled by granola coloring. Brown and white eggs have the same nutritional value; the color of the eggs depends on the species. I think most supermarket organic eggs are brown because we consumers connect brown food with healthier food (whole wheat bread vs. white; whole grain pasta; brown sugar), but really there is no difference (and this becomes annoying at Easter when I can’t find organic white eggs for coloring the eggs!). For a more extensive explanation of what the different egg labels mean and whether there are nutritional benefits to paying more, click here. Now, you’d assume that you want the freshest of eggs to hard boil, but that is not at all the case. 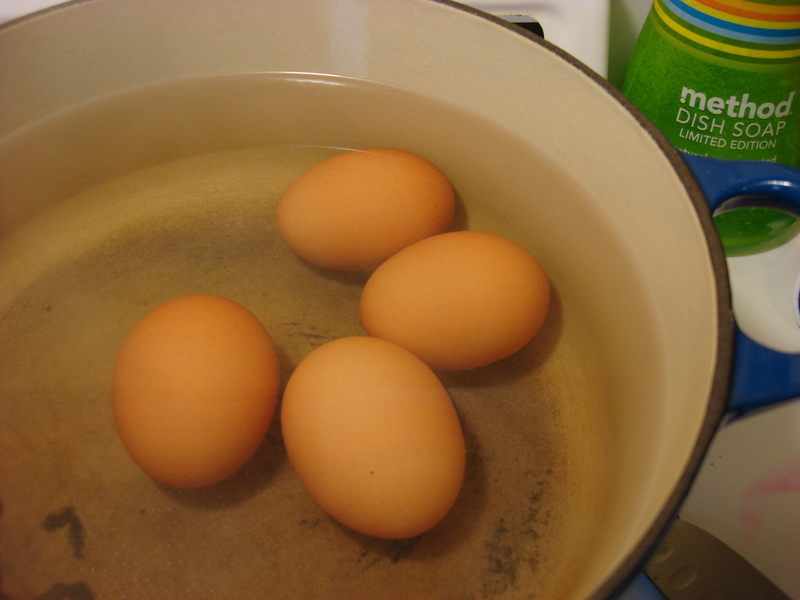 When eggs are fresh they are very dense and will sink to the bottom of a bowl of water when uncooked. The yolk and white fill the shell to its maximum capacity and therefore, when you try to peel it the shell won’t separate and it cracks and takes chunk of egg white with it and is generally quite annoying. 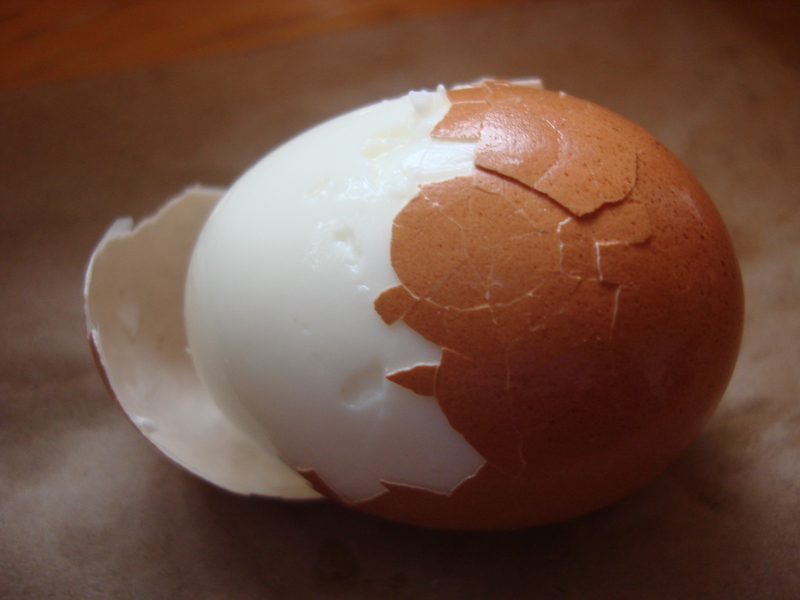 As the egg gets older, it loses some moisture through the shell. The inner membrane separates a bit from the shell, especially at the wider end. An air pocket will form there and if you place the raw egg in a bowl of water, the air pocket end will float up. The egg is still quite fresh enough to eat, but now will be easier to peel because the membrane is looser. So don’t use the freshest eggs for hard-boiling! When the egg is too fresh, peeling becomes a challenge. And do shock them in ice water. The theory is that the shock of the cold also causes the membrane to retract and become easier to peel, plus you want the cooking to stop when the egg is perfect. Don’t ask me where I got the theory, because I can’t remember whether it was Cook’s Illustrated, some T.V. show, or at an egg seminar by Chef Dan Barber at Stone Barns a few years back. (yes, I have been known to go to egg seminars for entertainment). Anyhoo, for creamy yolk with no uncooked bits and no dusty overcookedness or green ring and a white that squeaks and is not rubbery, following these simple steps virtually guarantees success. Every time. Creamy, perfectly cooked yolk. One of life’s simplest pleasures. Place desired number of eggs in a pot. Add enough cold water to cover eggs by about an inch. Cover and allow to sit for ten minutes (15 if you are a Nervous Nelly, but you really don’t need 15 and you risk overcooking). Drain and shock in ice water for at least five minutes. Done! I haven’t boiled an egg in ages. Lovely done soft with toast fingers. Good advice for the summer salads, if we ever see summer again…. You’d be surprised (or maybe you wouldn’t) at how often I have to consult my notes on properly boiling an egg. Thank you for this information! Bookmarked (and hopefully memorized at some point)! Good tips. We get fresh eggs every week from a friend. To help peel the very fresh eggs which can sometimes be difficult, I add about a tsp. of vinegar to the water. Oooh, that’s very interesting! Karen at Backroads says she uses a teaspoon of vinegar!